Home - Think you know what you can recycle? Think again! Recycling can make a big impact on what? ‘the health of our environment and on our wallets’ – and with our recent survey revealing that 99% of Brits practice some form of recycling at home, the potential’s there to get more materials than ever out of landfill and back into the production chain. But the survey also revealed that some people are confused about what they can recycle, and what they can’t. Although it’s encouraging to know that most people are clear on the basics – recycling aluminium cans, glass bottles, plastics, paper and cardboard – there are a number of missed opportunities. For instance, 87% of people thought they couldn’t recycle pieces of asbestos, while 72% thought the same about engine oil and 67% about cooking oil. Pouring oil down the sink isn’t just wasteful – it also causes blockages and it’s really bad for the environment! 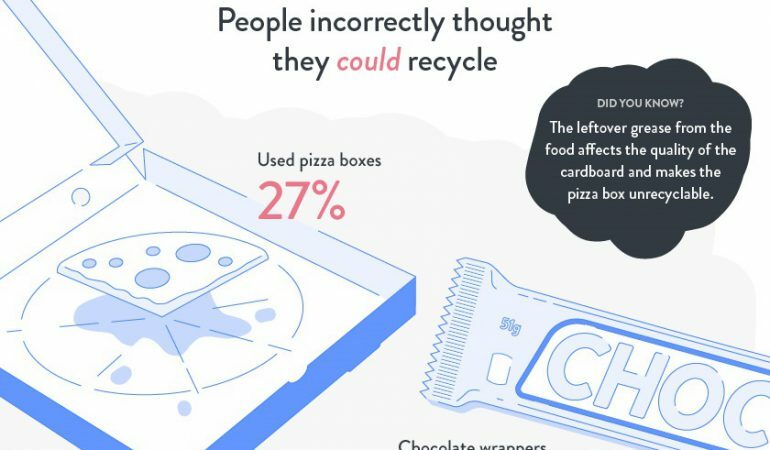 Meanwhile, 27% of people incorrectly believed they could recycle used pizza boxes, which can’t be reused due to the leftover grease – it can’t be separated from the paper fibres. Another 26% thought chocolate wrappers were OK for the recycling bin too, but unfortunately, they’re not! To celebrate the launch of our Scrappage Scheme, which rewards customers with up to £3,000* for recycling their windows and doors (another important thing that many people aren’t aware they can recycle) we’ve produced a new infographic detailing some of our favourite recycling facts. Glass and plastic – the two main components of our doors and windows – are extremely important recycling materials for a few reasons. Glass can be recycled endlessly, with no loss of quality and purity, so the more we recycle the better. As well as reducing the raw materials used, one of the biggest benefits of glass recycling is the energy savings. Melting down glass for reuse requires far less energy than making it from scratch – in fact, every bottle recycled saves enough to power a light bulb for four hours. The same goes for plastic, too: it takes 75% less energy to make a bottle from recycled plastic, compared to using new materials. And rather than ending up in landfills or, worse, the sea, all that plastic could be making useful things. For example, eight plastic bottles can be used to make a pair of jeans – and every tonne of plastic bottles recycled saves an estimated 1.5 tonnes of carbon. Of course, double glazing is a great way to improve your home’s energy efficiency already, as it makes a very effective insulator, reducing the amount of energy you need to keep warm in the winter. Recycling your old windows and frames when you upgrade to Anglian double glazing isn’t just good for the planet – it’s good for your pocket, too! For more reasons on why you should embrace recycled materials at home, click here.